Hello folks! Today I'm going to be blogging about something that I've always felt strongly about but never had an opportunity to talk about it. Before I begin on this rather personal post, allow me to introduce to you Safer Internet Day 2014. Please do not close the tab just yet. 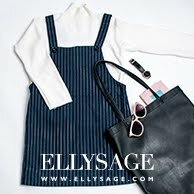 It's not going to be just another advertisement post neither is this just another blogging deal I've got. I do enjoy blogging about anything related to fashion or beauty but some how, I feel very strongly about this campaign because I truly believe in its purpose and motive. 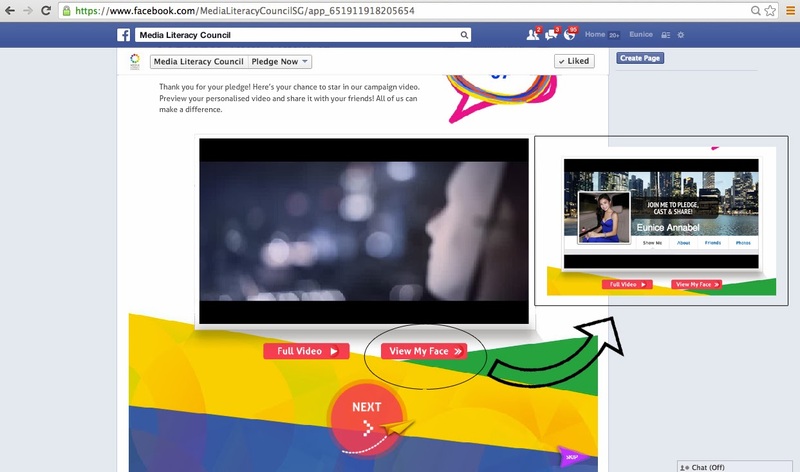 When Gushcloud handed me out this task from Singapore Media Literacy Council (MLC), I was initially confused and I had no idea how my blog's genre would match this campaign. But after attending a much-needed meeting with MLC themselves, I walked out of the room eager to finally get all of my thoughts out on this space. First and foremost, the Media Literacy Council (MLC) works hand in hand with our government to ensure that public education regarding media literacy and cyber wellness is developed. The world is continuously developing and it is inevitable to not be connected with one another through social media platforms. Let's be honest, having Facebook, Twitter and Instagram accounts plays a huge part in our lives whether we are frequent users of them or not. My cousins, nieces and nephews who are barely even 12 are constantly engaged in the virtual world and at times, they may even be more tech-savvy then I am. We can look at it in both positive and negative ways but we have to acknowledge the fact that technology and the Internet are part of our lives whether we like it or not. Here's how Safer Internet Day comes into the picture. I remember only starting a Facebook account about 7 years ago, at the same time when the first few smart phones were introduced to the world. Back then; I'm sure many of us weren't as hooked onto these social media platforms as we are today. It has become the way we live and interact with one another. I'm sure it was all fun and games initially, and there’s definitely positive attributes to these platforms like staying connected with your friends whom you may not see very often. On the other hand, it has come to my attention that these platforms have also become some sort of portal for users to confront or hurt another individual without coming into real contact. It's not surprising to witness "dramas" online that really shouldn't even be mentioned on a space that everyone is free to visit and use at all. I am certain that most of us have come across such cases where an individual is bullied and spoken ill of. And in the process, onlookers get to be a part of it as well when it shouldn't even concern them. But since the discussion is put on display online, naturally they'd feel the need to take a stand as well because there simply aren't any boundaries. And here's what I've always been afraid to write about. I am SICK of the online world. Try to picture the way things are said and done online in the REAL world. Imagine random people on the streets stopping by a conflict and taking sides on a situation that they may not even know anything about. Imagine someone sitting beside you on a bus outspokenly saying mean things to a complete stranger opposite. It's hard to imagine and it may even be funny to think about it but the reality is, if we don't do this sort of things in our REAL lives, why do we do it in our VIRTUAL lives? This is why up till today; I do not wish to own an Ask.fm account. As we all know, the digital space allows us to hide behind anonymity which many users take advantage of. People enjoy leaving behind crude remarks towards me there even if I hadn't done anything wrong and I don't feel the need to constantly be answering questions from people I do not know. It applies the same way to my real life. I don't see random strangers asking me questions or saying spiteful things to me. Look at yourself. Don't you think that the Internet would be a better and safer place if your virtual life were a little bit more like your real life? Here's how you can do your part to make our Internet a safer place for everyone. Empathy: We were all brought up with a mentality to always spare a thought for others. We learn how to think before we say certain things so that it wouldn't hurt anyone. Why can't we apply this very simple value of empathy when we tune in to the virtual world? I think that it is important to always put yourself in the other person's shoe before saying or doing anything. Imagine if you were getting cyber bullied and cornered by hurtful comments by random people instead. How would you deal with it? How would you feel to know that there are people out there hating you when all they know about you is your name? So spare a thought for others. Don't do what you don't want others to do to you. Responsibility: Every action has a consequence. And I think that the best way to take responsibility when you're online is to ask yourself if you would regret whatever you intend to post when you're 5 years down the road. If you have already said or done something that shouldn't be put on display online, take responsibility for it. Admit that you were wrong, and amend it. It's never too late to reflect and just apologize. Integrity: I feel that this is significantly missing from the virtual world, specifically from Singaporeans. We all know that majority of Singaporeans tend to "mind their own business" even when something terrible is happening right in front of their eyes. Take about 30 seconds to think of a situation where something bad happened online. Did you keep quiet and watch? Did you jump onto the bandwagon and start criticizing without knowing the full story? Or did you stand up against it knowing that whatever was happening is wrong? Staying away from trouble is a great option but some times, it'll also be awesome to be that person that says, "This isn't right. We don't know what happened and there are always two sides to every story. So we shouldn't be too quick to judge. Maybe we should take a step back and let the matter rest in the hands of the two parties." We all have voices and at times like this, it would be great to utilize it instead of wasting it away on taking sides and displaying our huge vocabulary of profanities. Respect: Everyone yearns to acquire respect. It is such a simple value that every one of us is capable of displaying. Most often, we forget that the key to gaining it is displaying. And it all starts with our choice of words. I've noticed that people these days aren't afraid to throw uncouth words online and I admit that I do it too. But I've learnt over the years that saying vulgarities online isn't going to get you far. That action and choice of words used already isn't showing respect to everyone else viewing it. And if you think that by using profanities is going to make others afraid of offending you, then you're wrong. I've learnt that it's always better to be loved then feared of. And that’s when you get the respect you truly deserved. Now that you've read all of this, it is time for you to decide if you want to make our online world just as good as our real world. Be honest and admit that the way we do and say things online isn't healthy at all. Think about the future generations, our younger cousins, nieces and nephews. They are new to the world and unlike us who've grown up without much Internet before; they hardly can function without technology. So we all know what responsibility, empathy, integrity and respect are. But these children might not because we aren't being good role models and we aren't displaying it much in the virtual world that they spend most of their time on. We don't see the seriousness of this phenomenon yet but if it is strong enough to cause so much pain and discomfort to many people's lives, then something is wrong there and it needs to be fixed. And it all starts with you. Try practicing the 4 values that I've mentioned earlier whenever you're online from now on. Let's take charge of the way we live online and try not to say or do things that you wouldn't commit in reality. And if haven't got anything nice to say, don't say anything at all. I hope I've managed to inspire you and it would be GREAT if you'd pledge to create a better Internet with me. From the bottom of my heart, I would really appreciate it if you'd spare just a couple of minutes to think about this and when you're ready, please visit www.betterinternet.sg. 1) Watch the video provided very carefully, listen to the words spoken and think about the underlining message that speaks to you most. I'm sure that you'll relate to it some how. 2) Wish to be a part of the video? You can star in it! hehehe. 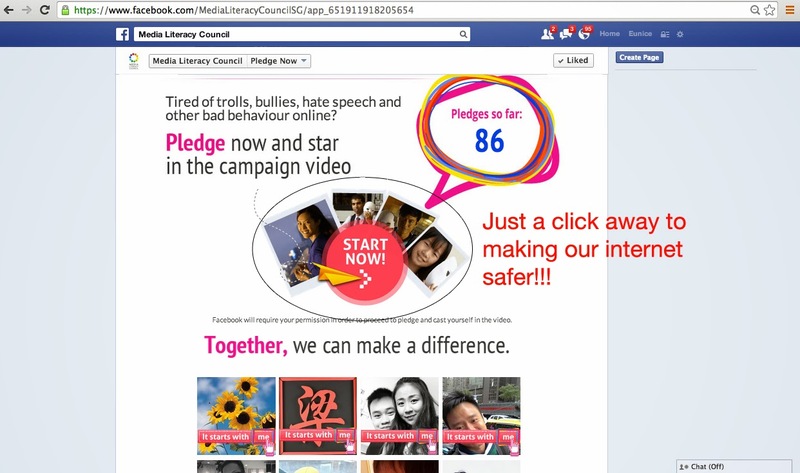 Simply pledge by clicking on the icon below the video. 3) You can choose a photo of your choice and once you're satisfied, click "Pledge Now!" 5) Thank you for being a part of this global initiative. Let's watch, as our world becomes a better place to live in both in reality and virtually. Remember to share your pledge with everyone! - Safer Internet Day 2014 will take place on 11th February 2014 this year. - There isn't a fix date for SID since it's always held on the second Tuesday of every February. - This is an international event and you can be a part of it! 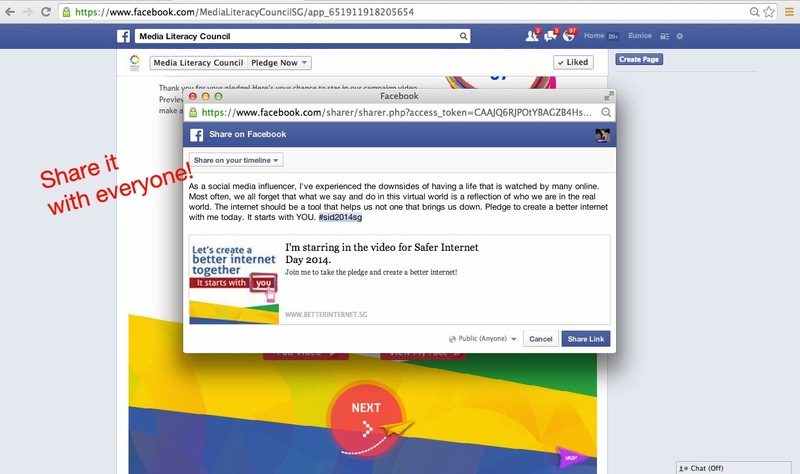 - SID is brought to you by Media Literacy Council with a global theme of "Let's create a better internet together". 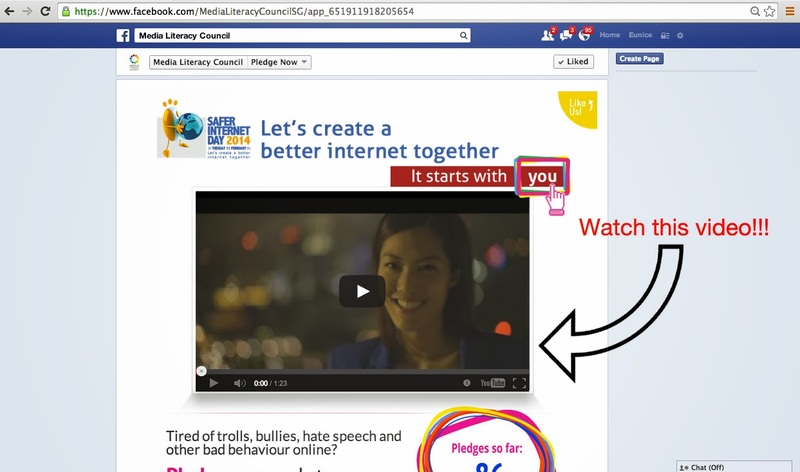 - You can find out more about #sid2014sg on Media Literacy Council (MLC) website at www.medialiteracycouncil.com, or MLC facebook page at https://www.facebook.com/MediaLiteracyCouncilSG. Remember that some people dream of things to happen while others get up and work on it. Be the ones that work towards a safer Internet :) Thank you for reading!